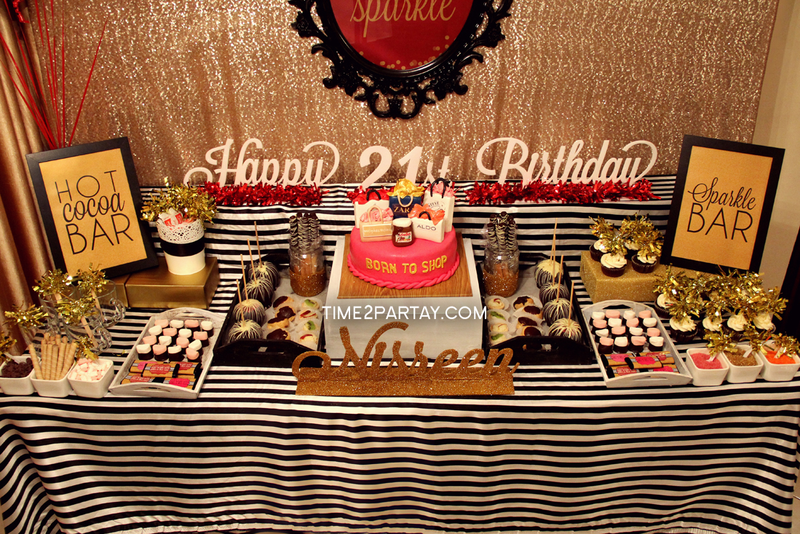 This sparkle themed 21st birthday was for someone that deserves all of the glitter in the world, one of my best friends, my sister. I can’t imagine my life without her in it. She’s one of the sweetest, funniest, most caring people I know. 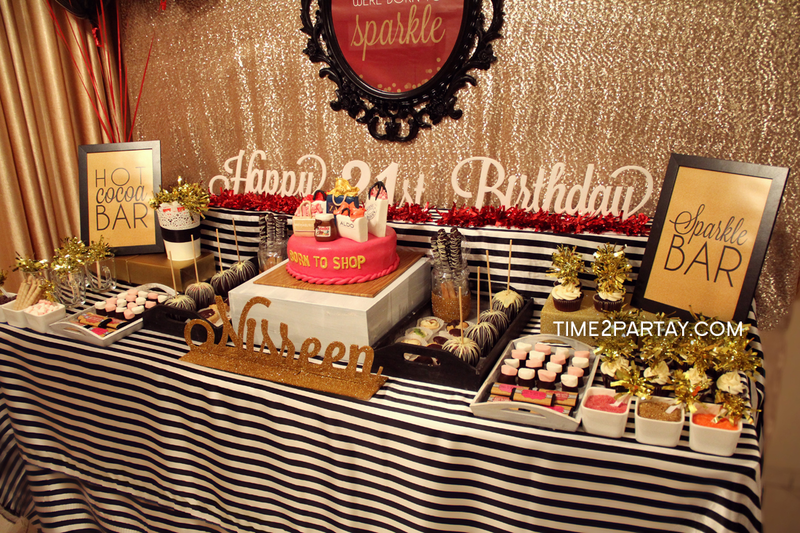 This party was just a small way of telling her that we love her, appreciate her, and to remind her to always sparkle. 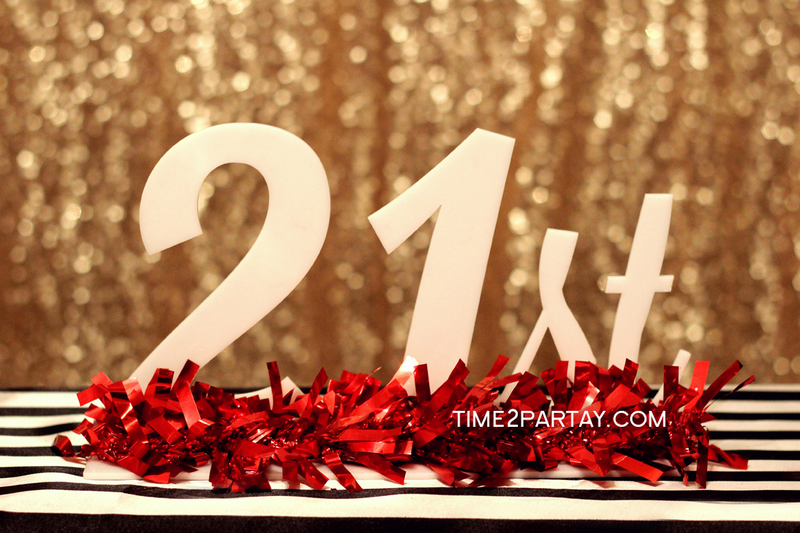 My baby sister is all grown up and deserves to be celebrated! 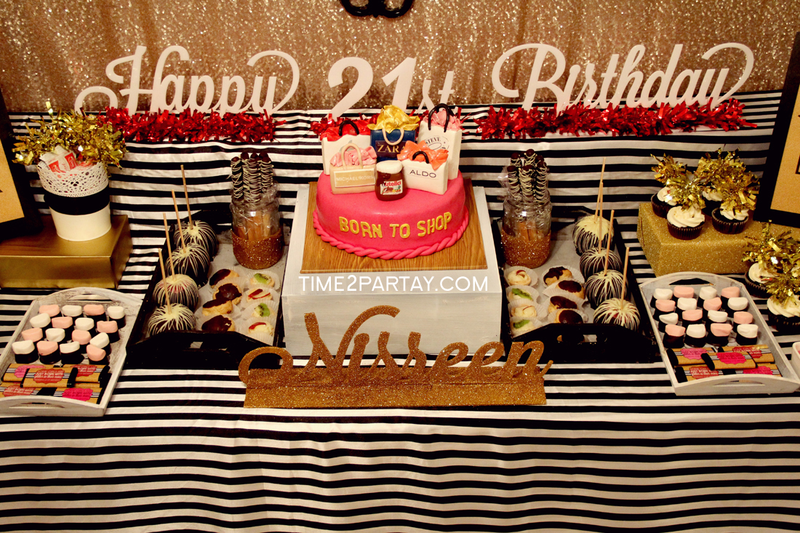 All of the details were inspired by her crazy addiction to chocolate and shopping, making it a perfect party for a shopaholic, chocoholic, and non-alcoholic. 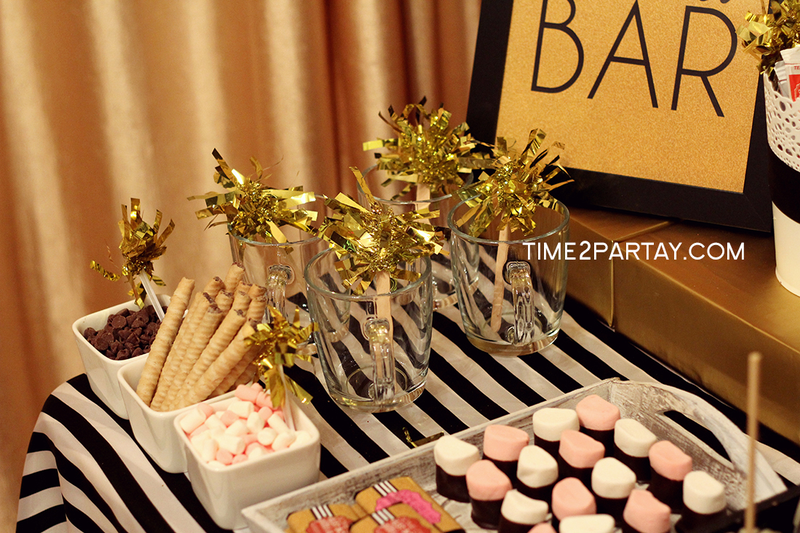 The main table had two “mini bars” on each corner. 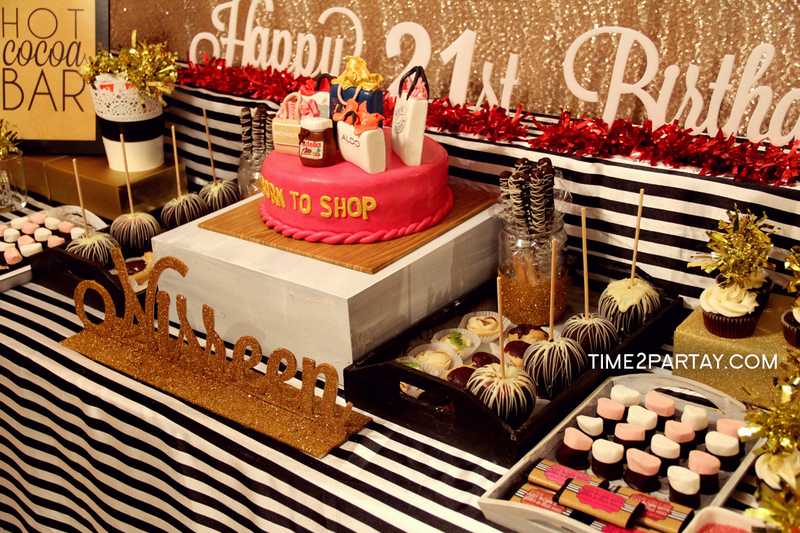 We made many of her favorite chocolate sweets, and Sukkar Cakes made us the perfect shopaholic themed cake. 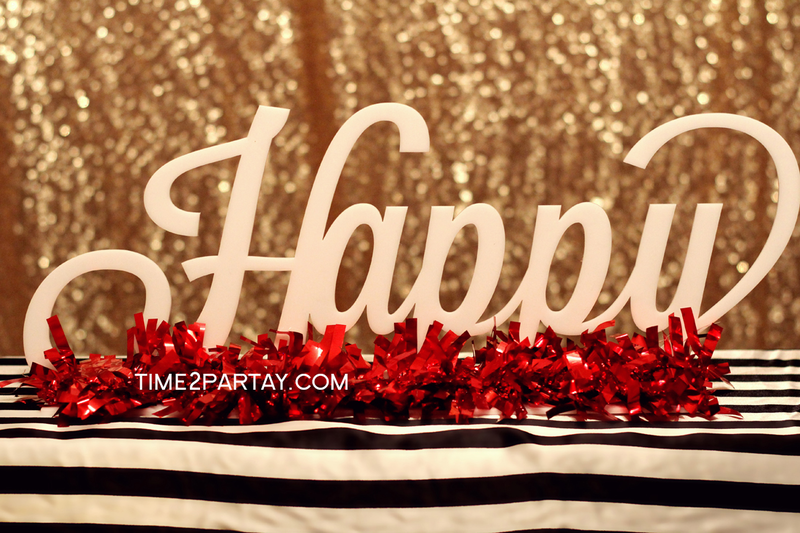 Since it was a surprise party, we had all of the guests hold sparklers as she entered, and her reaction was priceless! 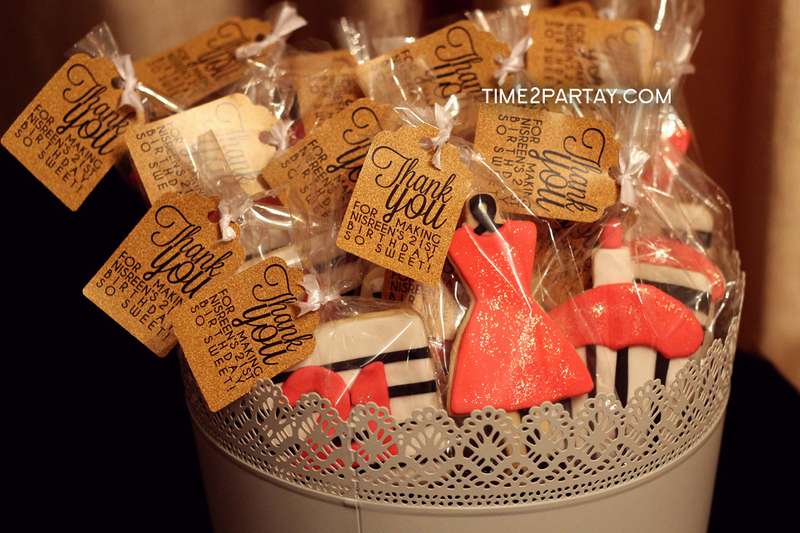 The favors were our homemade cookies, and we also made a cute guest book alternative. 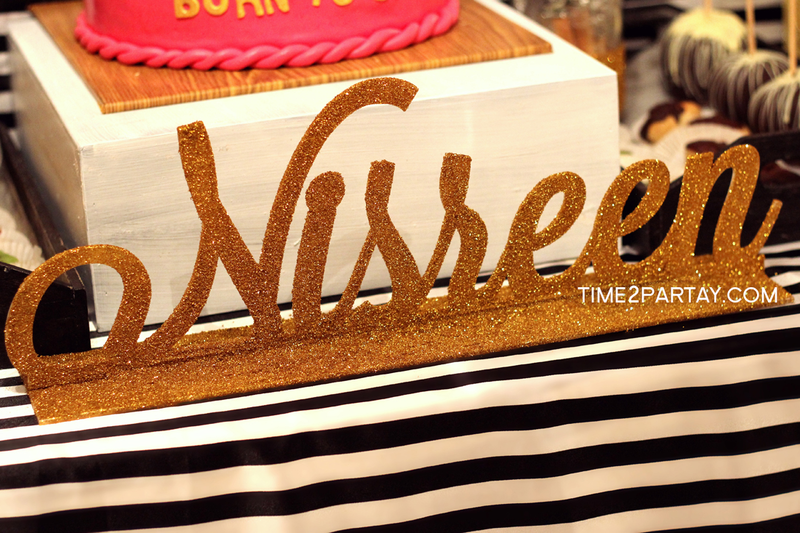 Happy birthday Nisreen, I still can’t believe my baby sister is 21! 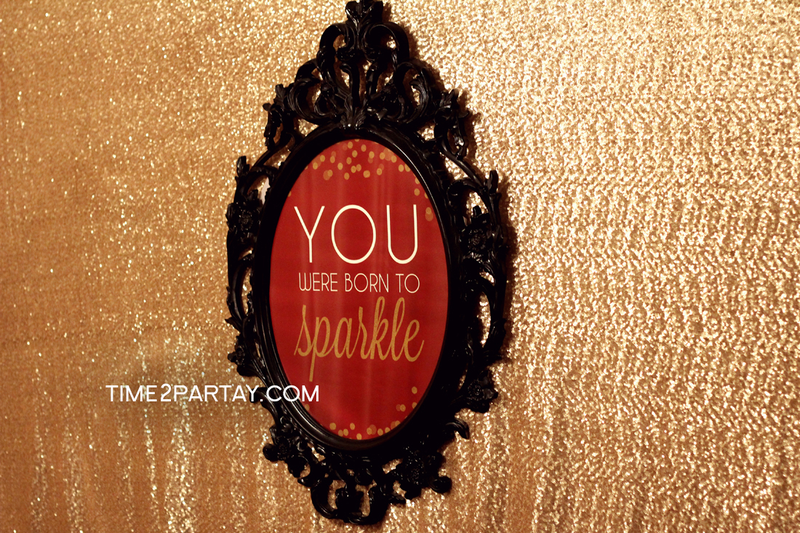 We love you so much, and don’t ever forget that you were born to sparkle! 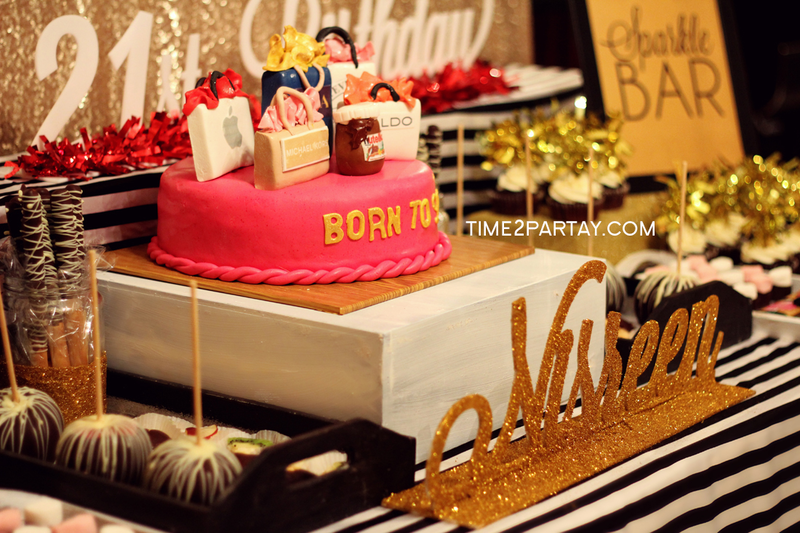 The main table. 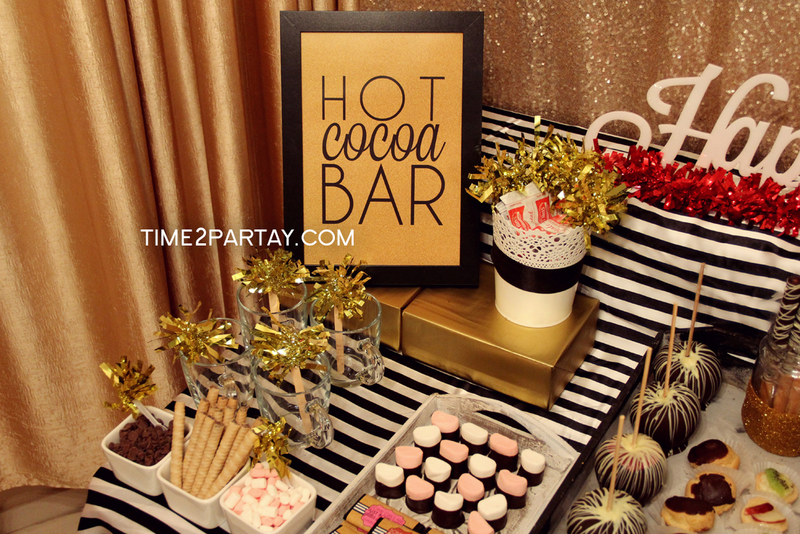 We added a mini hot cocoa bar with delicious toppings, and a cupcake “sparkle” bar with cute sprinkles. 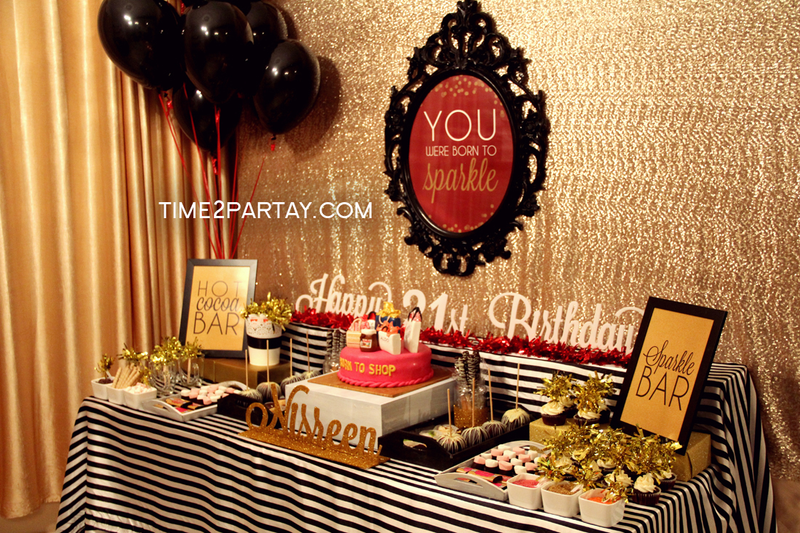 The colors of the party were gold, black, white, red, hot pink, and orange. 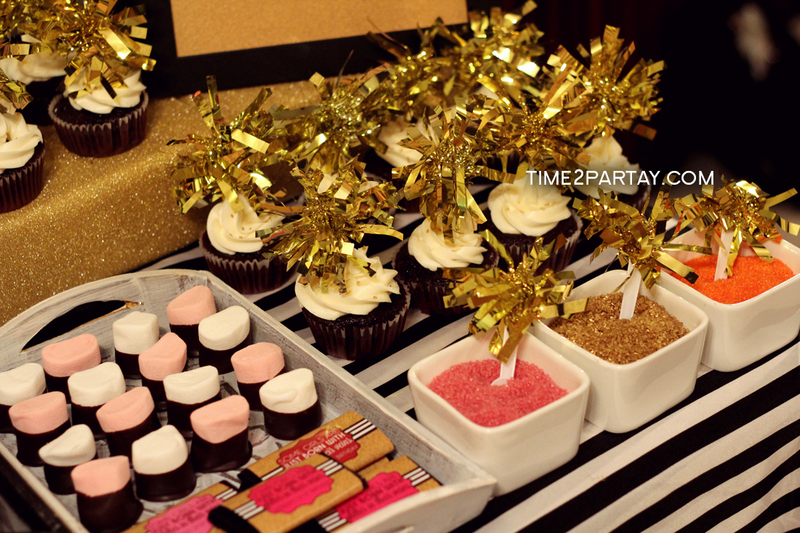 All of the sweets added to the table are some of this chocoholic’s favorites. 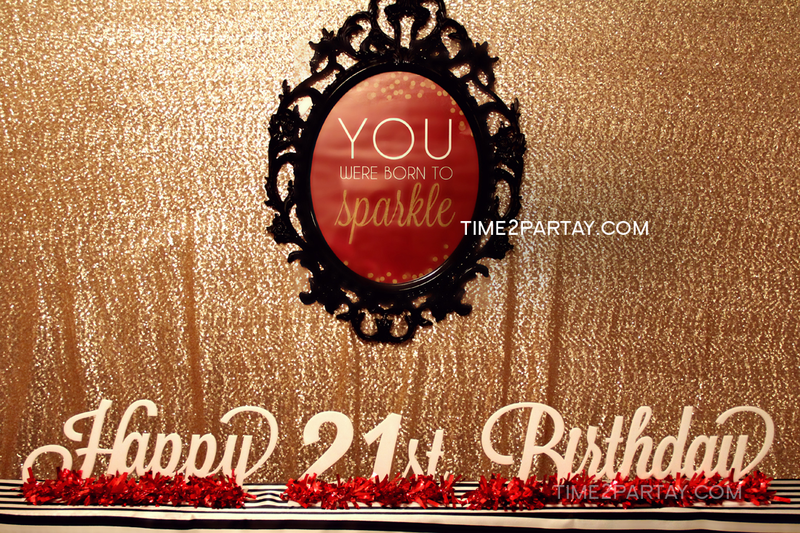 We designed this background frame and added the phrase “You were born to sparkle” in it. 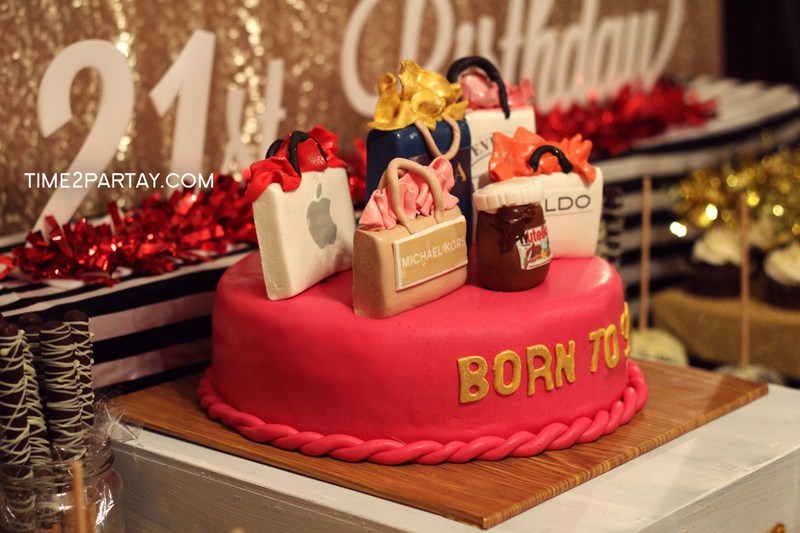 This cake by Sukkar Cakes was perfect! 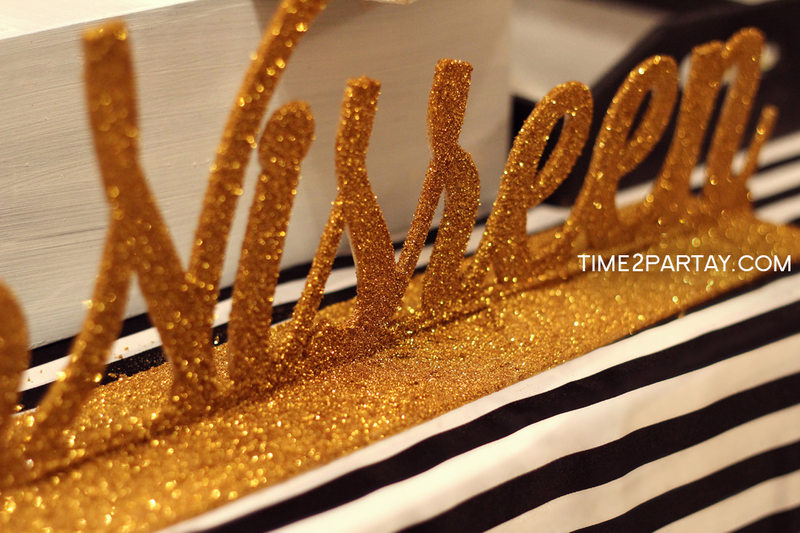 I wanted all of the shopping bags to represent most of the previous gifts that we got my sister throughout the years. 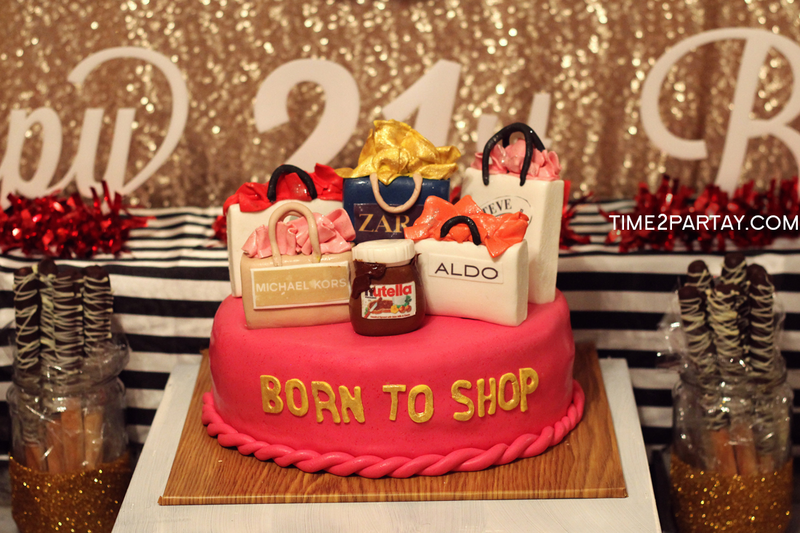 The Nutella jar just had to be on the cake because, well, it just had to be. 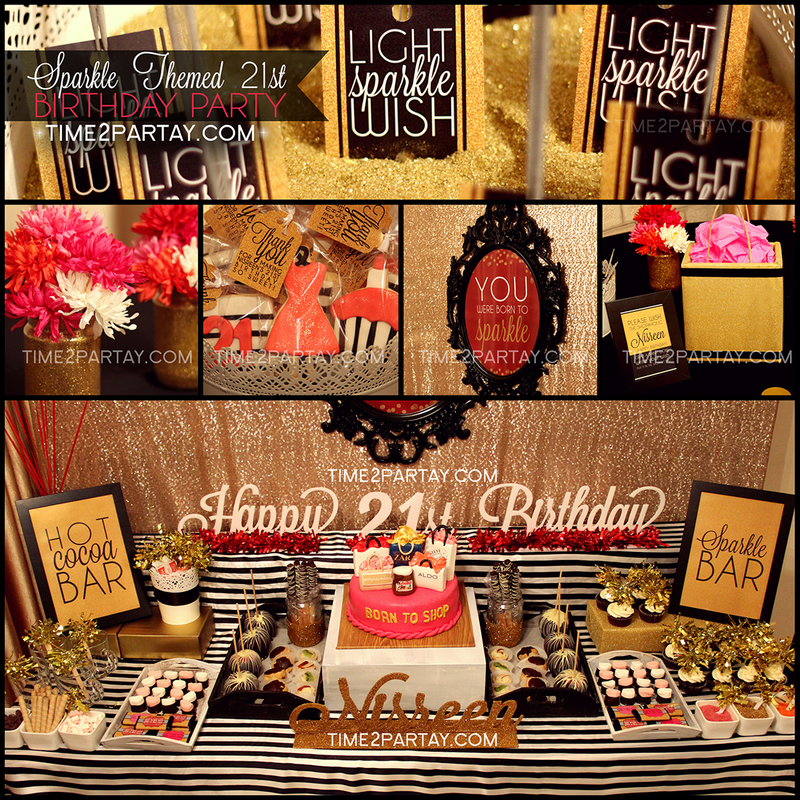 This is the perfect way to make sure the birthday girl will never forget any of the gifts that we got her! 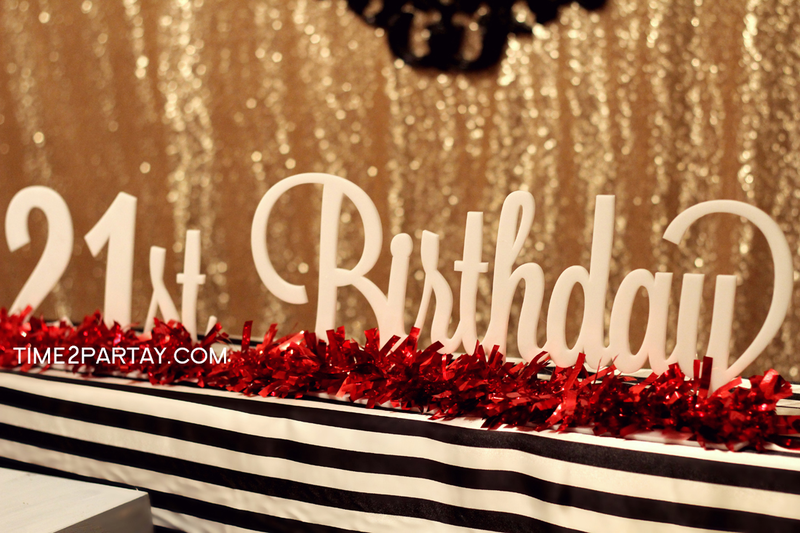 We designed this birthday banner alternative and decorated it to match the theme. 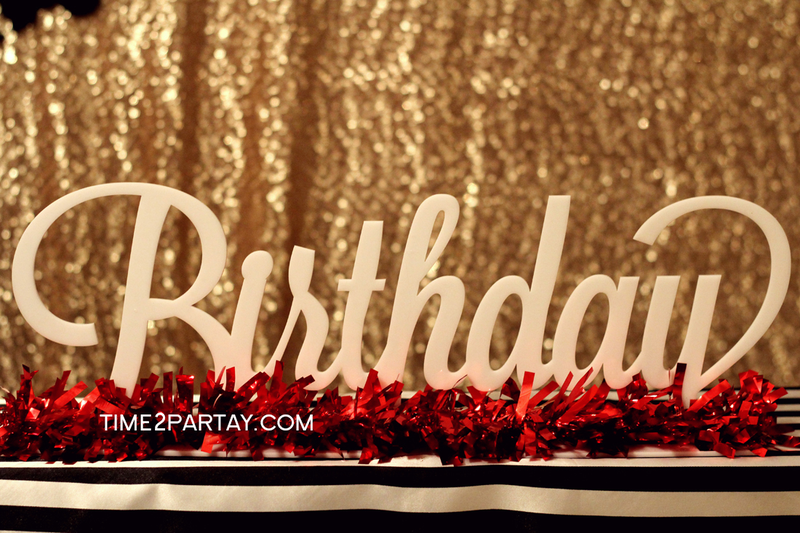 This birthday banner alternative could also work as a fabulous centerpiece! 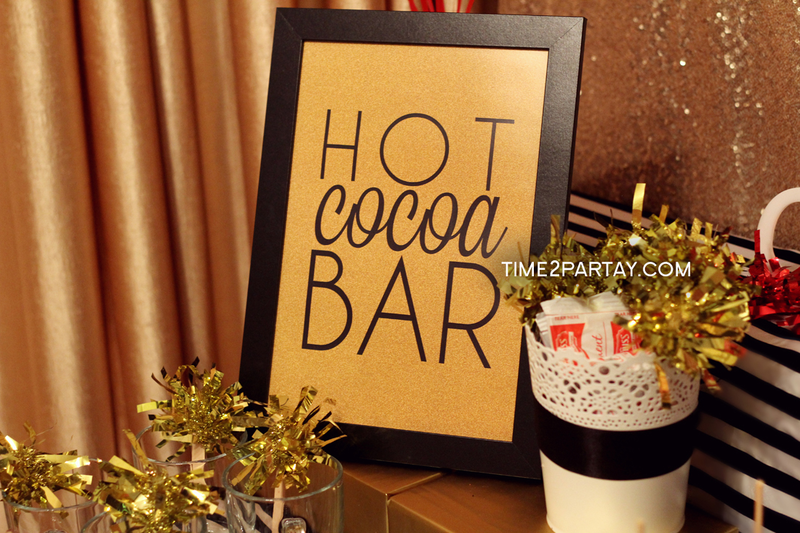 The mini hot cocoa bar. 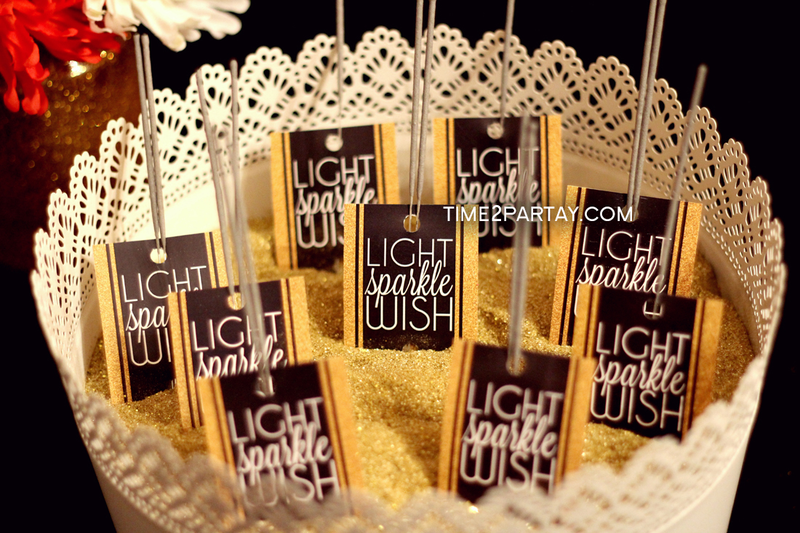 We added cute gold fringe to all of the spoons and coffee stirrers. 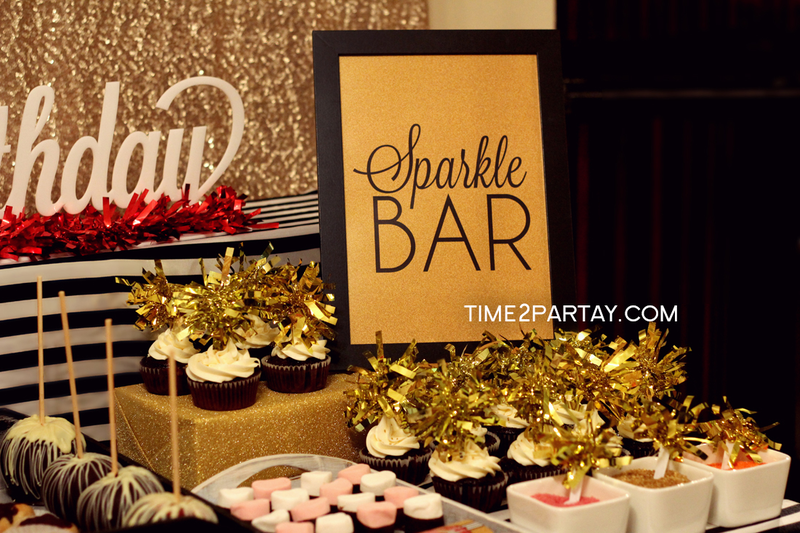 The cupcake “sparkle” bar. 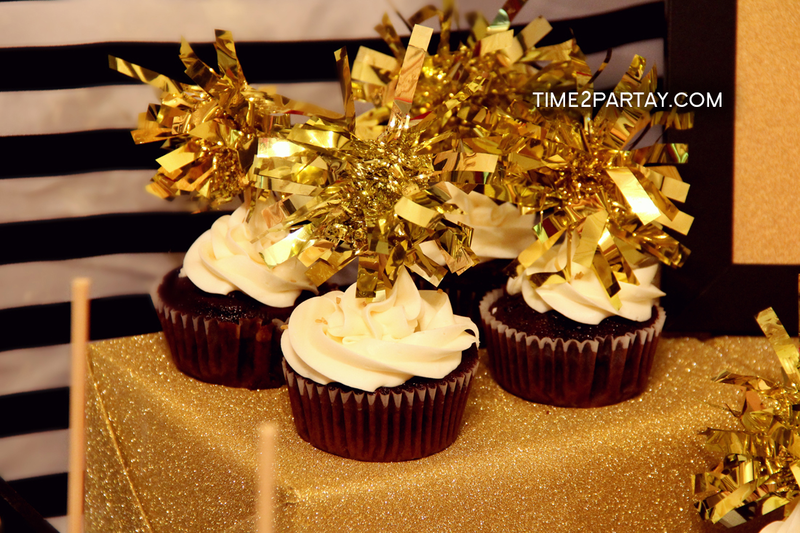 We made some homemade cupcakes and decorated them with gold fringe toppers. 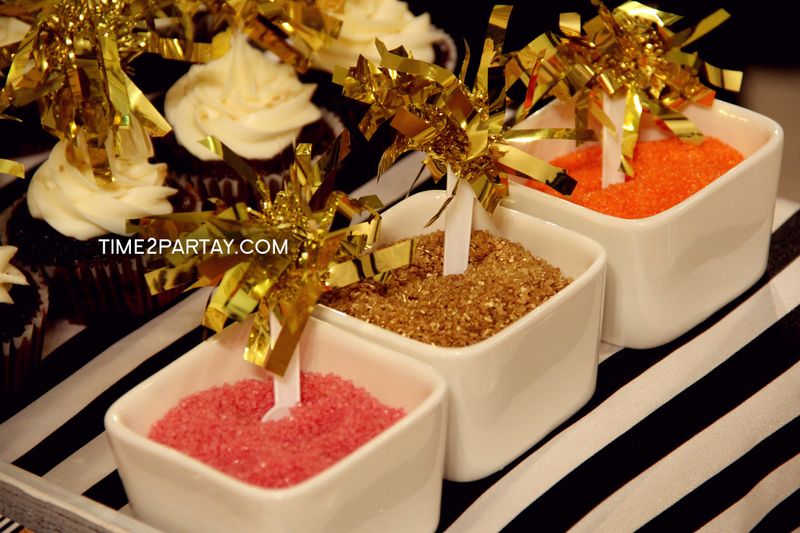 We also added some pink, gold, and orange sprinkles for the guests to add as toppings to the cupcakes. 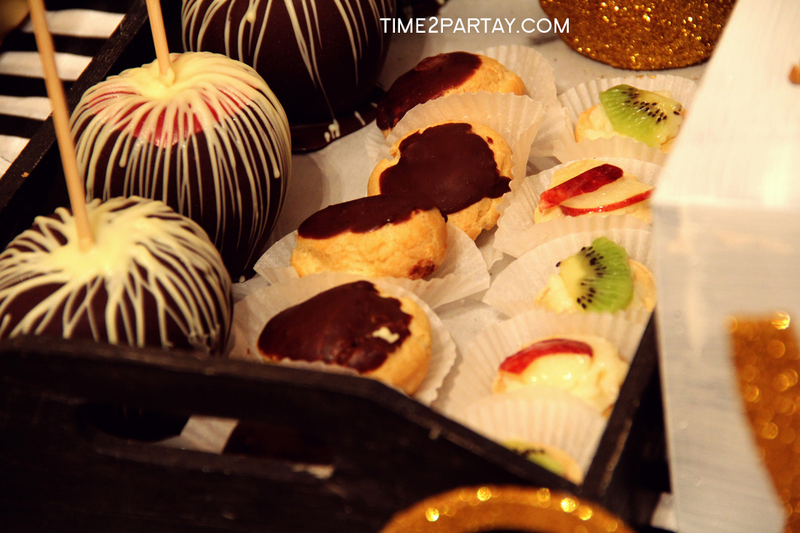 These mini éclairs and fruit tarts by Sukkar Cakes were delicious! 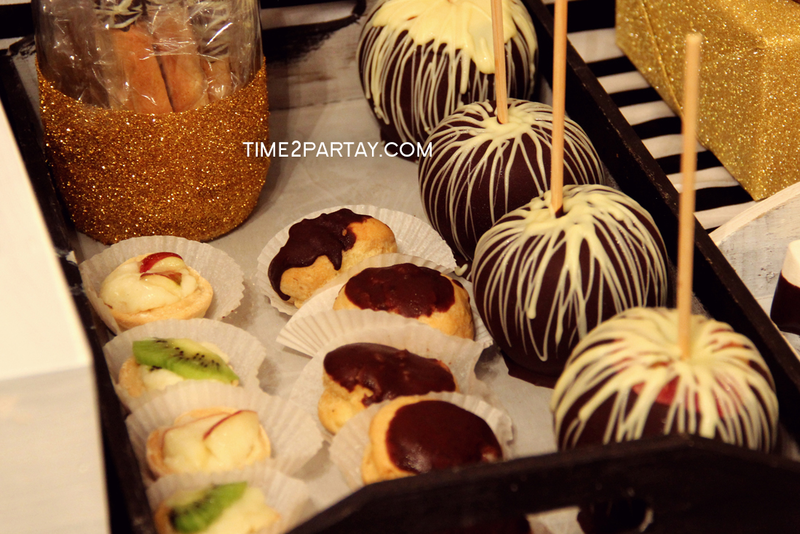 Our homemade chocolate covered apples. 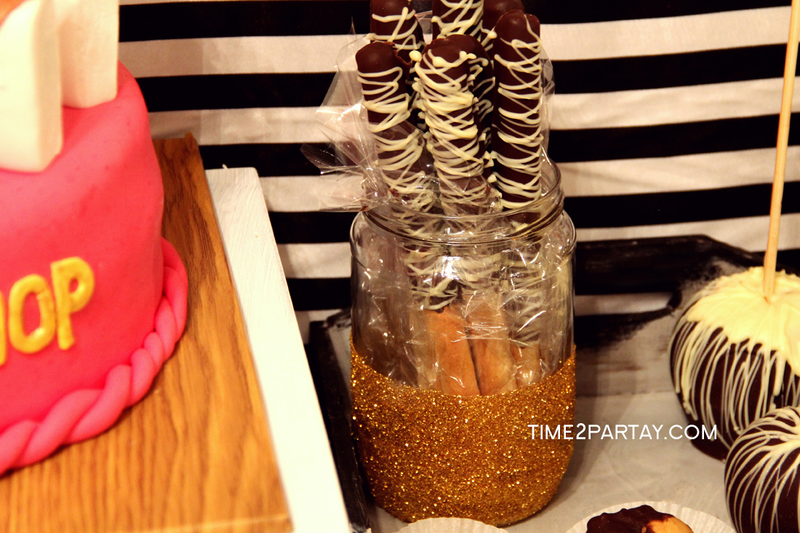 Chocolate covered pretzel sticks in gold glitter jars. 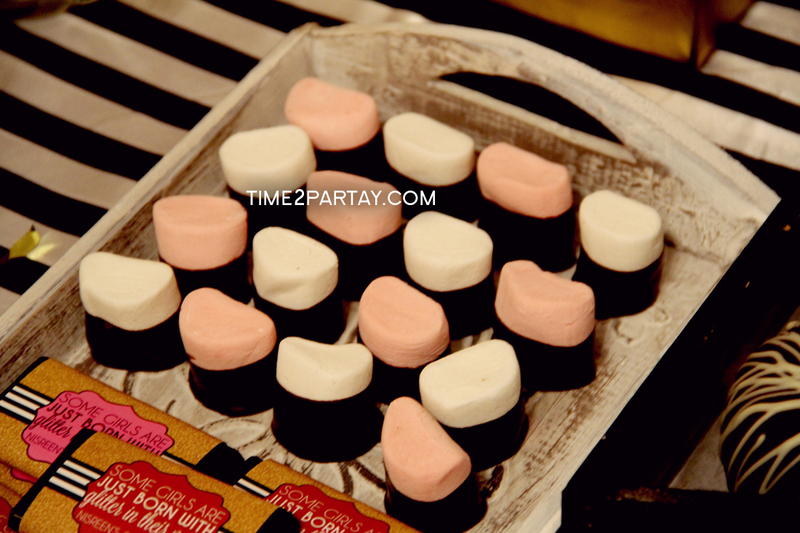 We also made these chocolate dipped marshmallows. 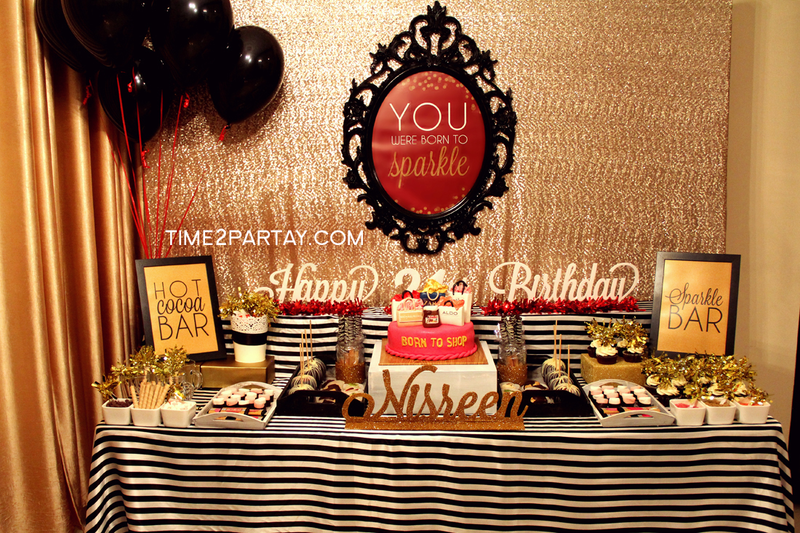 We designed these mini bars to fit the theme. 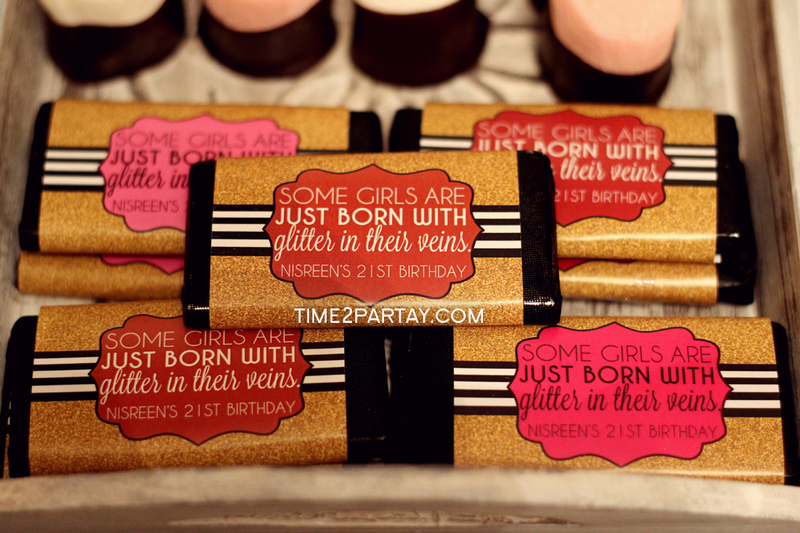 Each chocolate bar had the phrase “Some girls are just born with glitter in their veins” and the birthday girl’s name and age. 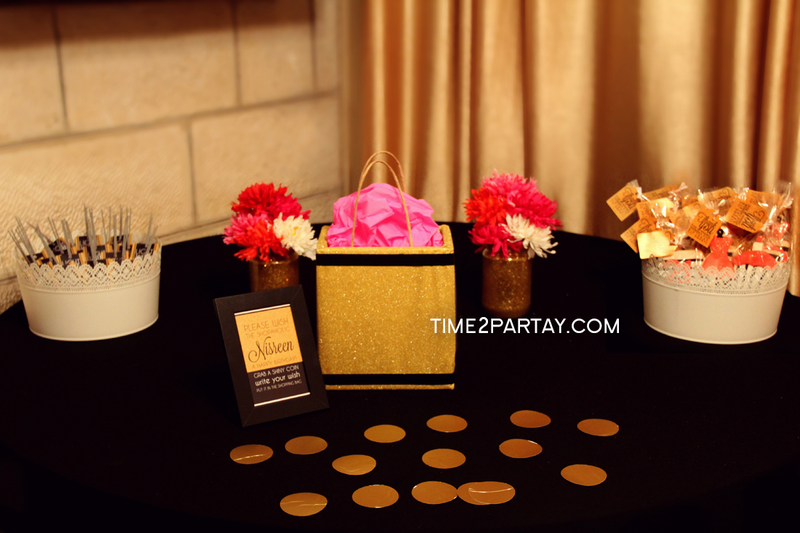 We added the guest book alternative, favors, and sparklers to this table. 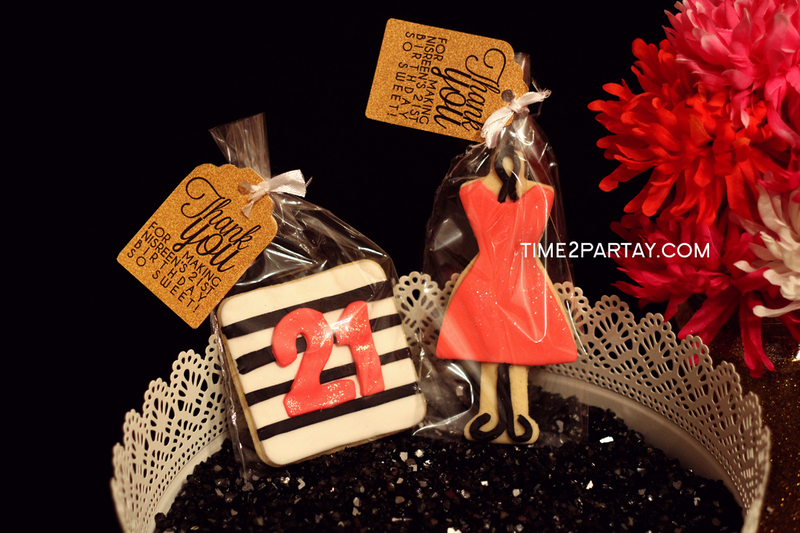 Each guest got to take home two of our homemade sparkly cookies. 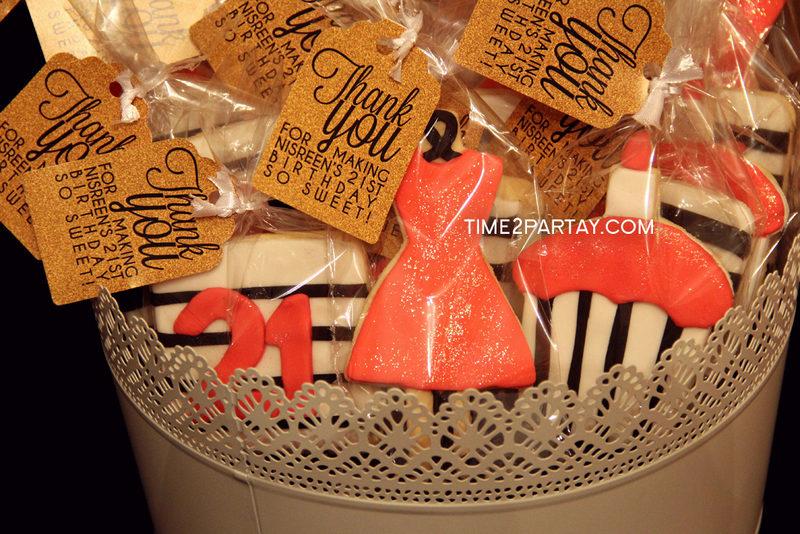 We designed this label and added it to each favor. 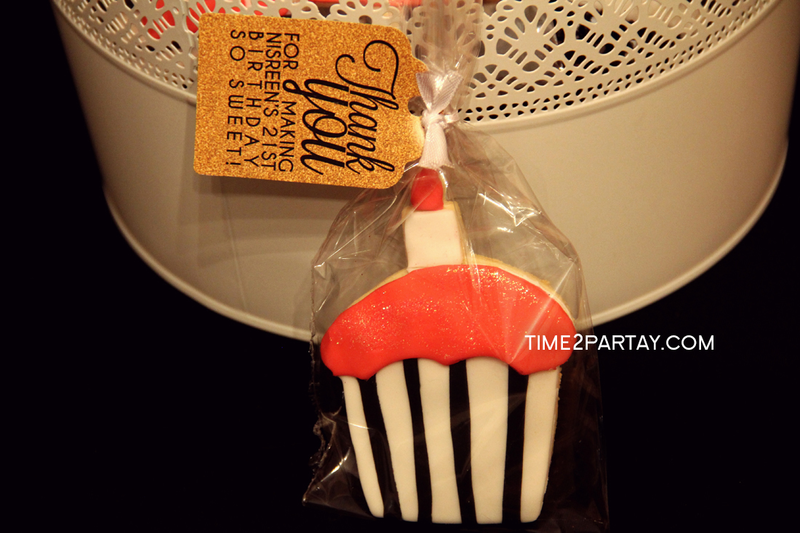 Our homemade cookie shaped as a glamorous cupcake. 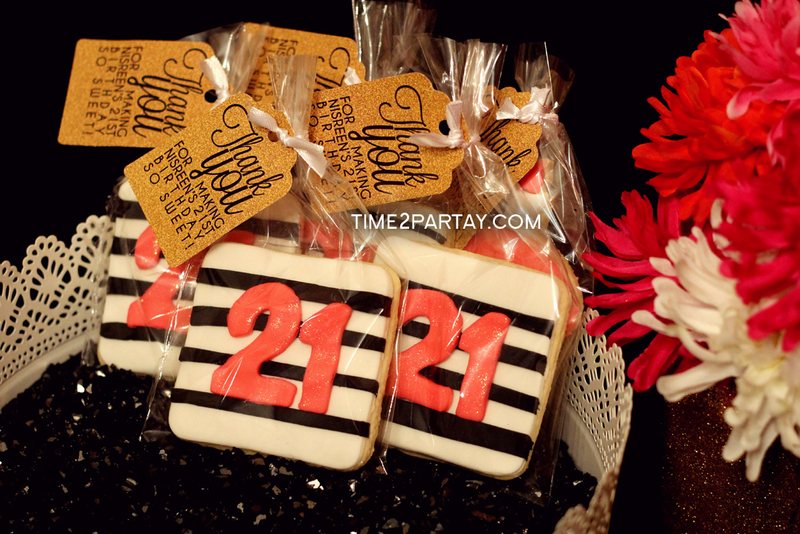 Our homemade stripe themed cookies. 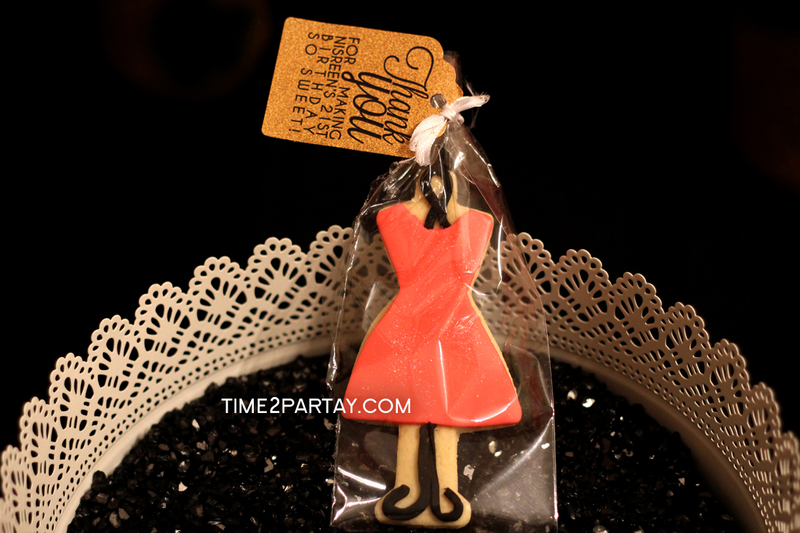 Our homemade cookie shaped as mannequin. 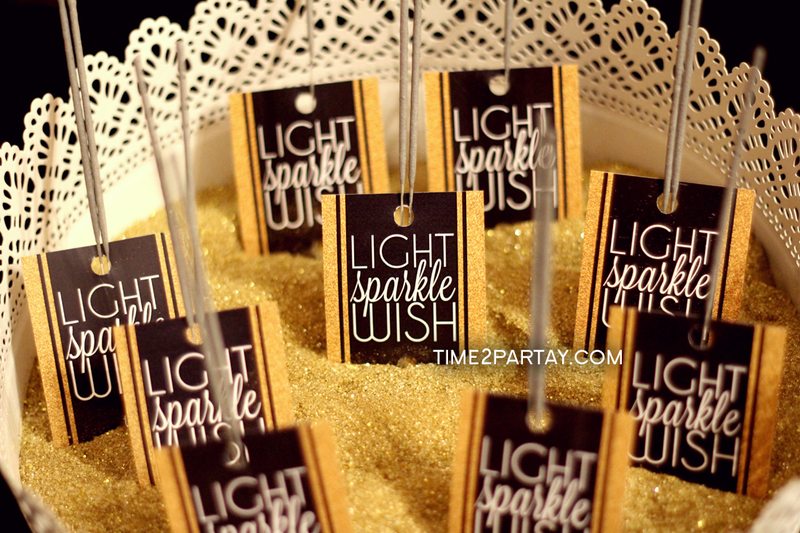 We designed these labels for the sparklers. 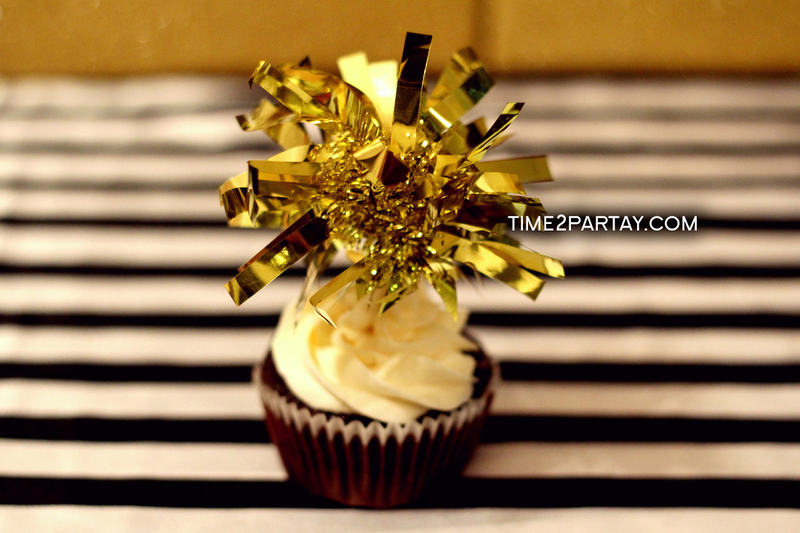 Each guest held a sparkler when the birthday girl came in. She was definitely surprised! 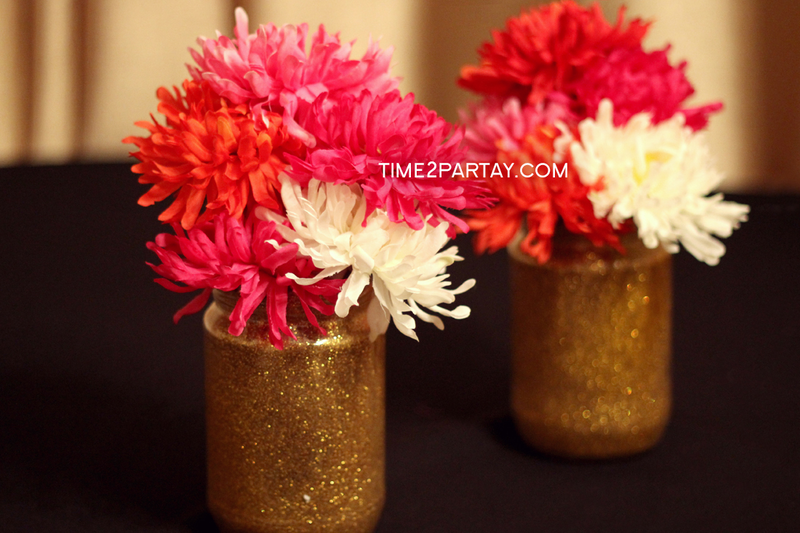 We made these beautiful glitter jars and added flowers that match the theme. 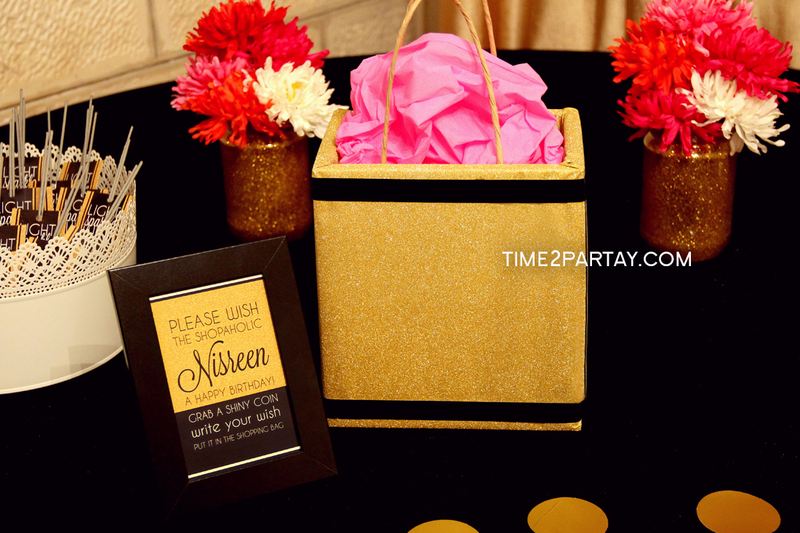 We made this guest book alternative shaped as a shopping bag, perfect for a shopaholic to take home after the party! 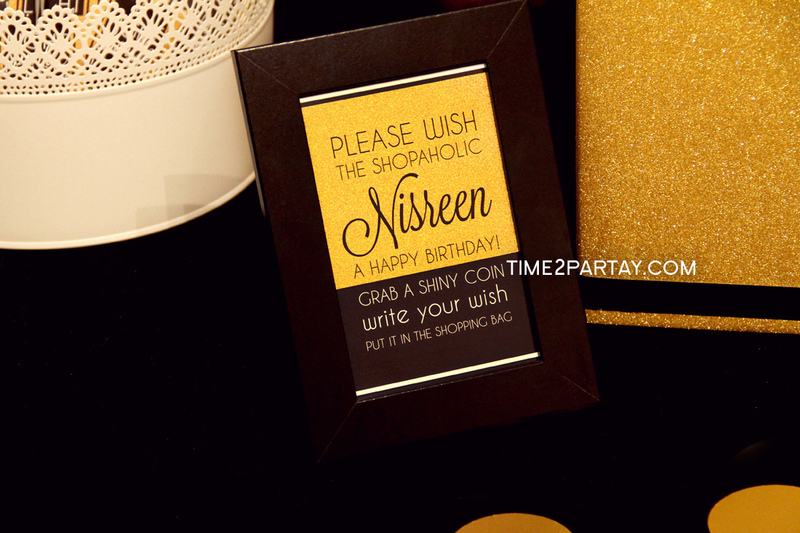 Each guest wrote her a special birthday wish on a shiny “coin”.